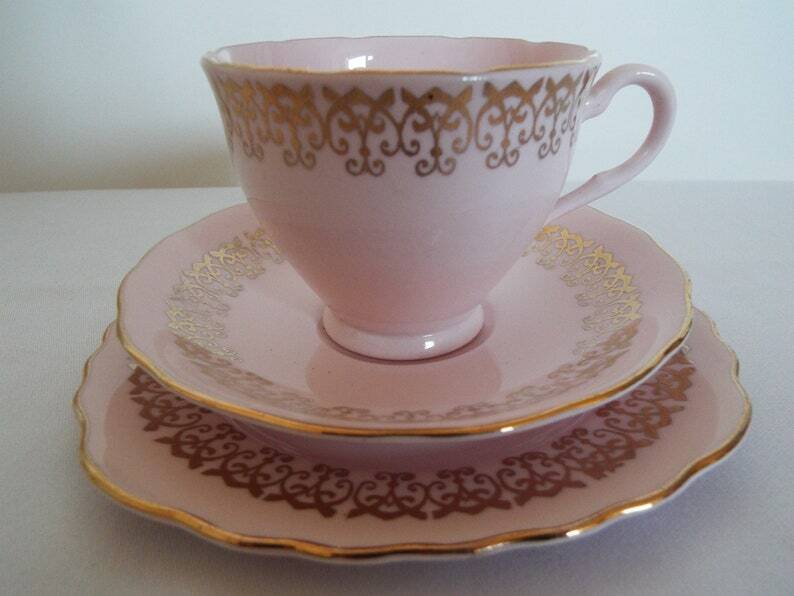 This English teacup trio is in an exceptionally pretty shade of baby pink, which looks lovely alongside the bright gold pattern which runs around all the pieces. The shade of pink makes this trio just perfect for a pretty pink baby shower, vintage wedding or girly tea party - its would look gorgeous with other pretty china and alongside dainty cakes and sandwiches! It is a pattern and style that perfectly captures a 1950s or early 1960s English home and would have hosted some special tea times, I am sure! It would also make a very special and beautiful trio for a Mother's Day tea time, or to give as a very special and one-off mother's day gift. Its pink colour makes it perfect for a pink styled baby shower or vintage styled wedding tea party. It could be given as a Valentine's gift too, with its romantic shade of pink. It would stand out on your tea table and display beautifully, especially in multiple numbers. This is a very eye catching and pretty trio, perfect for serving a cup of tea alongside quintessentially English teatime cakes. The reverse of each element of this trio is stamped with 'English Bone China'. There is no maker's mark. This trio is in excellent vintage condition. There are no damage cracks, chips or crazing to the glaze. The pattern is in good bright condition, with just some slight wear to the gold in places which is commensurate with age and use. I have photographed this trio in natural light, but the exact shade of pink you view may vary slightly. depending on your screen settings. The close up photos make the shade of pink appear slightly paler than it actually is, due to my camera working hard to allow in extra light for taking the shot. Any further wear is commensurate with age and use. Please just ask if you would like any further photos. Your order will be GIFT WRAPPED FOR FREE in my pretty standard year round gift wrap, unless you select the Christmas gift wrapping option. Please see my other listings for examples of my Christmas gift wrapping. Please read my shipping policies before ordering. I always combine shipping of multiple items ordered wherever possible and I ALWAYS refund any shipping over charges where they arrive. Please get in touch if you are considering ordering multiple items and would like a shipping quote before ordering. Vintage Teacup and Saucer, English Bone China Teacup Trio, Floral Teacup Gift Set. A pretty 1930s teaset for an afternoon tea party!